It is not everyday that you find a band that is close-lipped as BEERWOLF. The only thing that one can read about them on their Facebook page or the label’s web page is that they are a “smoke laden Groove Rock dragon riders of the riff filled lands.” Judging from the gig posters Facebook page they must be somewhere from the south of the US. 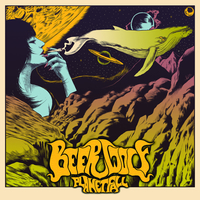 BEERWOLF is the perfect choice for a “smoke laden Groove Rock band”, the only other viable option would be to play ALESTORM inspired Pirate Metal, but BEERWOLF choose to play 100% authentic & certified Southern Stoner Rock with nods to Stoner/Doom bands like SLEEP or ELECTRIC WIZARD and to 60s Acid Rock, so let’s get it. The 46 minutes long album titled “Planetfall” consists of four instrumental songs and five songs with vocals. I have nothing bad to say about the instrumental jams, there are some nice grooves, some cool fuzzed out guitar playing, but only the title track really caught my attention with its heavy, sinister Stoner/Doom riff. The rest feels to me like cool groovy jam rock, OK – but nothing special. The songs that feature vocals are solid, all have memorable hooks and good riffs, but it does feel so archetypally Stoner Metal that it can feel a bit rehashed. I particularly dig “Crom’s Steal” because of the melody in the chorus that feels a bit NWOBHM inspired – it is bold and epic in a way that reminds me of GRAND MAGUS and other Heavy Metal leaning bands. I really like Jason Kleim as a vocalist, his voice has character and he’s cut out perfectly for singing in a Stoner band. These guys do what they do and they do it well: they write good riffs and quite memorable tunes. It might not be super interesting for someone who is not an avid fan of the current fuzz rock revival. I also would prefer an album with less instrumentals on it, or these instrumentals could bring something more to the table. To me this feels like perfect party Rock for 2018 for guys who like beers, bongs and flannel shirts (who doesn’t…?). Go check BEERWOLF out if they play at your local venue, bang your head and party hard.